Ajmera, Maya, Victoria Dunning, and Cythnia Pon. Healthy Kids. Ajmera, Maya, Elise Hofer Derstine, and Cynthia Pon. Music Everywhere! Arndt, Ingo. Best Foot Forward: Exploring Feet, Flippers, and Claws. Aston, Dianna Hutts. An Egg Is Quiet. Aston, Dianna Hutts. A Rock Is Lively. Aston, Dianna Hutts. A Seed Is Sleepy. Barner, Bob. Bears! Bears! Bears! Berkes, Marianne. Over In a River: Flowing Out to the Sea. Berkes, Marianne. Over In the Forest: Come and Take a Peek. Biggs, Brian. Everything Goes by Land. Biggs, Brian. Everything Goes by Sea. Brocket, Jane. Cold, Crunchy, Colorful: Using Our Senses. Brown, Don. Henry and the Cannons: an Extraordinary True Story of the American Revolution. Bunting, Eve. The Cart That Carried Martin. Butterworth, Chris. See What a Seal Can Do. Campbell, Sarah C. Wolfsnail: A Backyard Predator. Floca, Brian. Moonshot: The Flight of Apollo 11. Gray, Rita. Have You Heard the Nesting Bird? Guiberson, Brenda Z. The Greatest Dinosaur Ever. Hopkins, H. Joseph. The Tree Lady: the True Story of How One Tree-Loving Woman Changed a City Forever. Houran, Lori Haskins. Dig Those Dinosaurs. Houran, Lori Haskins. A Trip into Space: an Adventure to the International Space Station. Huber, Raymond. Flight of the Honeybee. Jenkins, Steve. Actual Size series. Jenkins, Steve and Robin Page. Move! Jenkins, Steve, and Robin Paige. My First Day: What Animals Do on Day One. Judge, Lita. How Big Were Dinosaurs? Krebs, Laurie. We’re Sailing to Galapagos: a Week in the Pacific. Levine, Sara. Bone by Bone: Comparing Animal Skeletons. Lewin, Ted. What Am I? Where Am I? Lunde, Darrin P. Hello, Baby Beluga. Lunde, Darrin P. Hello, Bumblebee Bat. Lunde, Darrin P. Hello, Mama Wallaroo. Lunde, Darrin P. Meet the Meerkat. Lunde, Darrin P. Monkey Colors. Malner, Carol L. On Kiki’s Reef. Morris, Ann. Bread, Bread, Bread. Morris, Ann. Hats, Hats, Hats. Morris, Ann. Houses and Homes. Morris, Ann. On the Go. Rockwell, Lizzy. Plants Feed Me. Sayre, April Pulley. 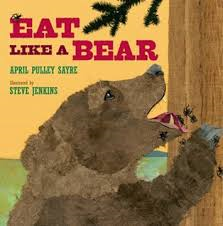 Eat Like a Bear. Sayre, April Pulley. Go, Go, Grapes! A Fruit Chant. Sayre, April Pulley. Let’s Go Nuts! Seeds We Eat. Sayre, April Pulley. Rah, Rah, Radishes! A Vegetable Chant. Schaefer, Lola M. Lifetime: the Amazing Numbers. Schafer, Kevin. Penguins 1 2 3. Stewart, Melissa. No Monkeys, No Chocolate. Stockdale, Susan. Bring on the Birds. Stockdale, Susan. Stripes of All Types. Teitelbaum, Michael. Baby Penguin Slips and Slides. Teitelbaum, Michael. Baby Polar Bears’ Snow-day. Ward, Jennifer. Mama Built a Little Nest. Ward, Jennifer. What Will Hatch? Thanks so much for including my books on your list–I’m honored to be included with authors I so admire, like April Pulley Sayre, Melissa Stewart, and Steve Jenkins!